Strings are largely a matter of personal preference. It is worth experimenting with different makes and tensions (gauges) of strings to find out what suits you and your guitar. 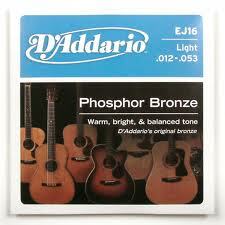 Bronze wound strings usually have a brighter sound, however they generally do not last as long as phosphor bronze strings, which have a slightly mellower tone.